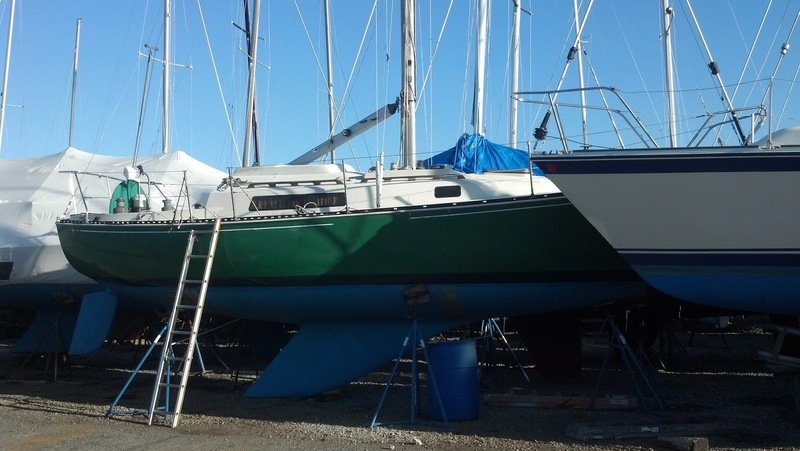 By the way: The best way to declutter your boat is not to put too much crap aboard. If you need inspiration, read this little book by Sam Llewellyn: The Minimum Boat. If you like to read an example column first: This is why. 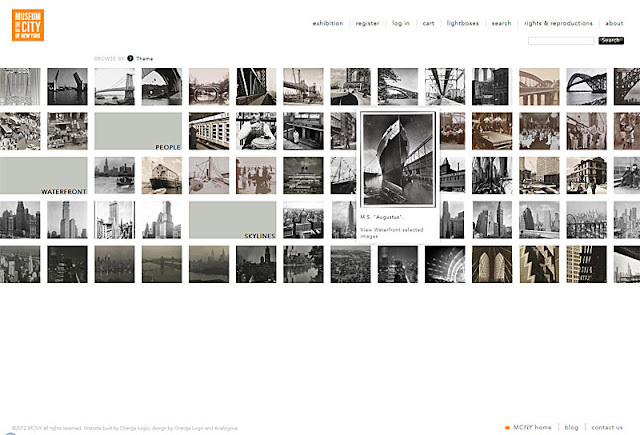 There are several databases which shouldn't be shunned if you ever look for historic photographs of New York. 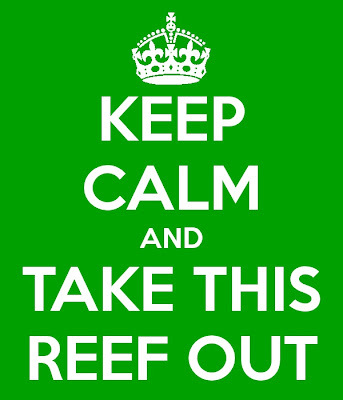 If the newfangled digital Municipal Gallery's server is too busy, here I provide some alternatives. On April 25, 2012, the NYC Department of records published 870,000 photos online. This is part of a digitization process of more than 2,2 million pictures in the archive reaching back to the midst of the 19th century. Crimes scenes, shot as evidence by police are here, the famous building portraits and photos documenting great projects like the building of the Brooklyn Bridge (by city employed photog Eugene de Salignac who was honored with the exhibition New York Rises at the Museum of the City of New York). Prints can be ordered as well. 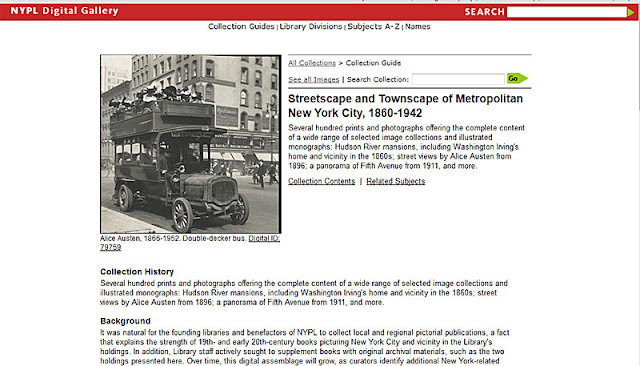 The vast collections of the New York Public Library contain more than 800,000 pictures alone. More than 51,000 are accessible through the mere keyword New York, but I recommend finer approaches by using the subject search (more than 91,000 results) or the matching keywords around it. Do absolutely NOT MISS the single collections, there are wonderful troves to be found, like the hundreds of photos Berenice Abbott took for her book Changing New York: Photographs by Berenice Abbott, 1935-1938. Head for the All Collection Guides to see more than a dozen digital collections about New York City alone! If you prefer to just get bounced around the most intriguing old photos of the city, try NYPL's Pinterest. 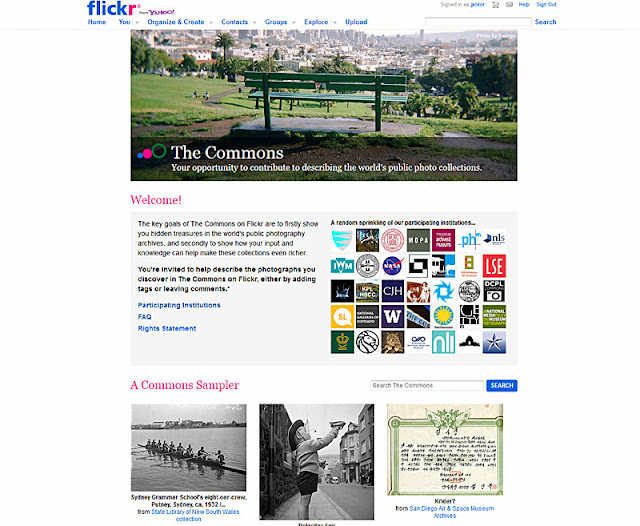 Amongst the many photographic collections on the web which are not just specifically about New York, Flickr Commons should be noted quite at the start of the list. The participating institutions add a never ending stream of historic photos in the public domain for easy access online. The most relevant for the City of New York are probably the New York Public Library, the Library of Congress, and the George Eastman House. Other good places to see New York related photography are for example the Jewish Museum, which recently had a great show about the Radical Camera: New York's Photo League, 1936-1951, or the International Center of Photography, which actually shows until September 2, 2012, grim photos in Weegee: Murder is my business. We Are Ready to Roll / Splash / Sail! Pictures from April 4, 2012. 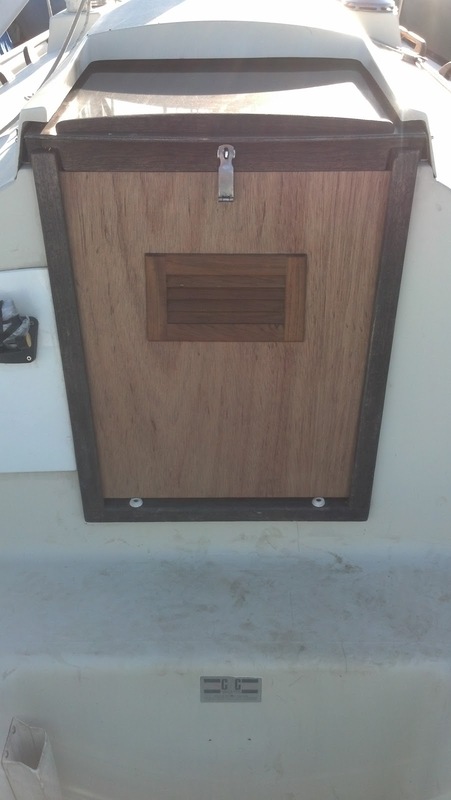 I built a new companionway door for Mistral IV and painted her a boot stripe in seagreen. Now we wait for John Barron's forklift to kick back into action - and the season can start, maybe even this Saturday, just before Easter. On Sunday I will be too busy cooking scallops and lamb. The new boot stripe goes all the way under the transom of Mistral IV. Most aboard is hunky dory, we even got a new john. 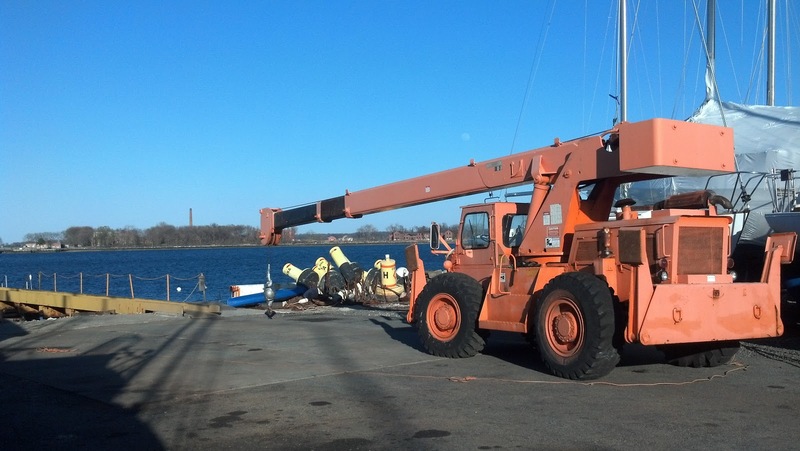 Last season we replaced the hand rails on deck and she got these wonderful 42 winches. Now the prop still needs attention and the rigging has to be a tuned a tad. 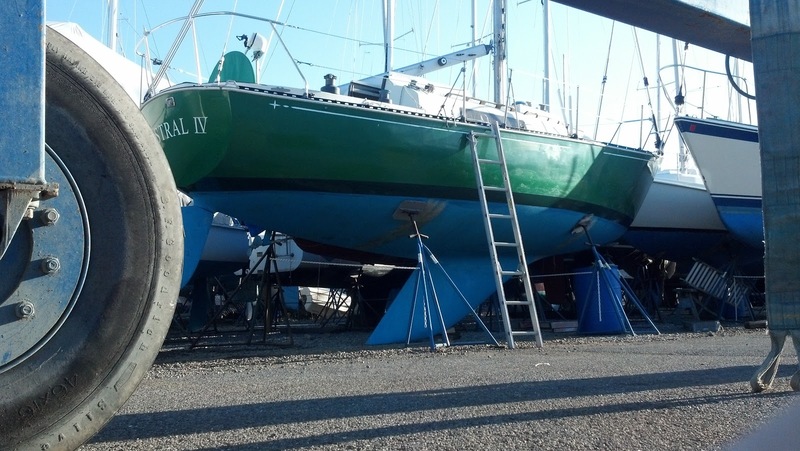 Barron's Boat Yard is located on the Eastern shore of City Island in the Bronx, New York. Just South of the beautiful historic Pelham Cemetery, John and his son Jason conduct serious marine business here. Affordable, honest and reliable is all you can wish for. 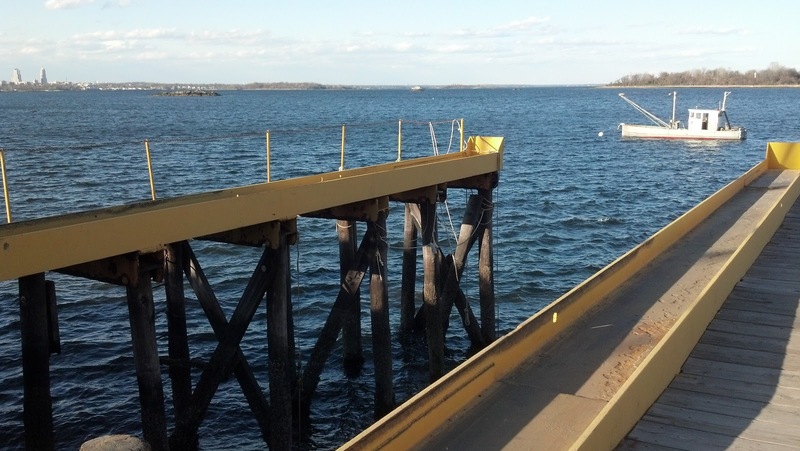 If you have a boat and need winter storage, consider giving them a call or check their website, it's worth your pennies. 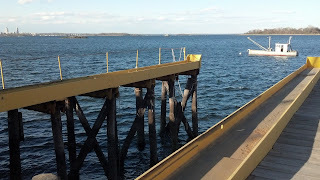 The waters between City Island and Hart Island in The Bronx, NY: The towers in the background at the left are Donald Trump's atrocities in New Rochelle in Westchester County, NY. Ugly as hell, they serve as a pretty good landmark for sailors in the Long Island Sound though: They can be seen from as far as Northport. Hart Island is used as New York's potters field. Inmates from Riker's Island come once a week to bury more of the poor and unknown - to add to the 750.000 people being interred here. Before it was the place where New York locked insane people away and let them work there. 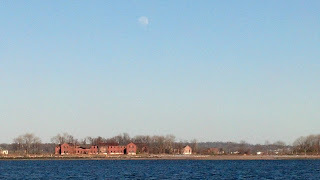 In the 1960s Hart Island housed several rocket silos. Speak softly, but carry a big hook. That's the way the boats get parked for winter storage. Out of the water via travel lift, out of the slings via the hook, onto the cradle 'till spring. Not all in reverse, please! Splash! Barron's travel lift parks right in front of Mistral IV, we are considered one of the first boats to go in - we hjad the longest season ever last year, and you know how it goes: Last out, first in! That's the way, a-ha, a-ha, we like it! 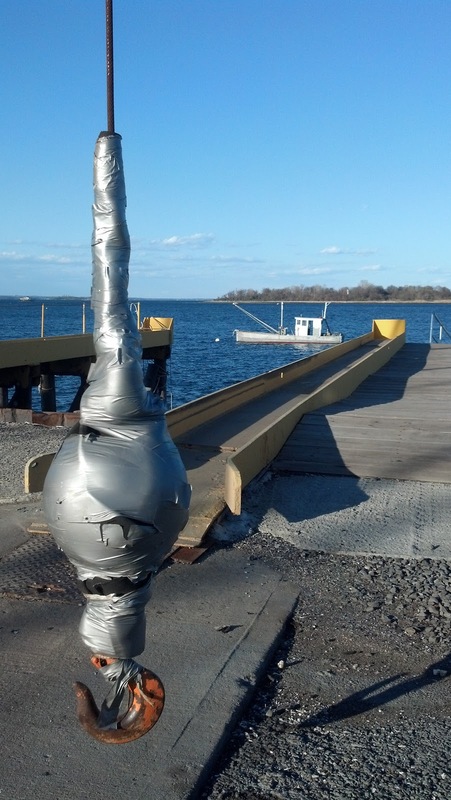 10 boat projects minus 9 boat projects equals 19 boat projects - you know your boat math, right? This winter I built a new companionway door, of mahoganny plywood with a massive mahoganny louver. Like the other wooden parts on Mistral IV, I treated it just with teak oil, only the edges are reinforced with epoxy. 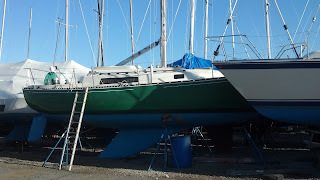 If everything goes well, we'll sail her up to Larchmont on Saturday. The rigging needs some attention before the splash: the disfunctional lazy jacks (who needs these anyway?) come off, the spinnaker halyard should get fiddled though the mast again and then we need the topping list to be fixed again at the mast top. But before the boat looked this way, I looked that way. 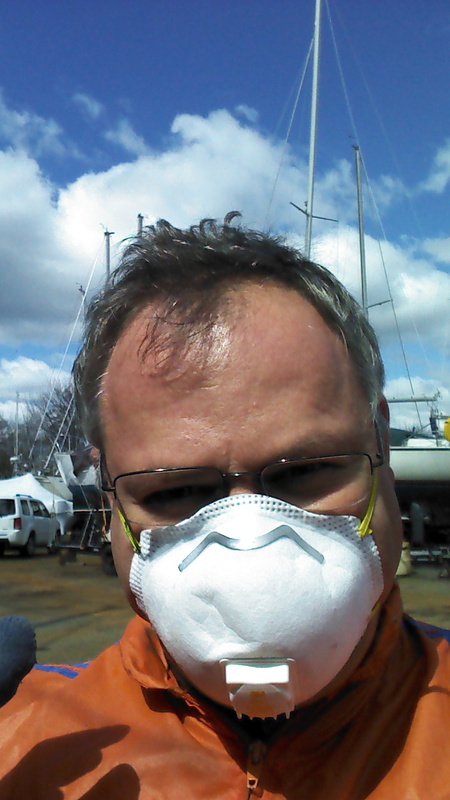 Taking a break from sanding the hull. In the improbably case you want to see more pictures of this beauty (the boat, stupid! 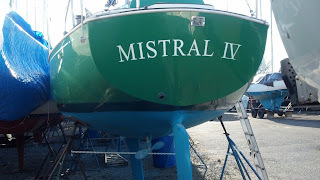 ), here is an exclusive link to a book I made two years: "Mistral - Under Full Sail" for the 90th birthday of my skipper. And not that you get any funny ideas: He stood next to me sanding the hull (yes, actually sanding his own part), climbs around as if there were no tomorrow and sails his baby at quite a clip! Make sure you click on "full screen" for the preview.